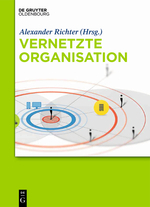 A couple of day ago I received my personal copy of a book called „Vernetzte Organisation„, in English „The networked organisation“ or even „Social Business“. In the context of the book the word „social“ is a synoym for „related“, „connected“, „networked“. I contributed a chapter in which I describe a practical method for influencing effective behaviour change called „6 Sources of Influence„. It’s a method by Patterson which I have come to use in some of my client projects. It’s a great way to think through the different methods and pressure points that can be applied to an individual or target group to influence their behaviour. The book is comprised of a large number of contributions written by academics and practioners from various view points but all talking about the future of work and organisations. It provides the theoretical framework to grasp the changes that organisations need to face if they want to be successful in the networked century. This is followed by various practioners presenting their respective projects and programmes which they initiated to prepare their organisation for the necessary changes and related challenges. Last but not least, the final third of the book is devoted to methods and toolkits that can help to successfully navigate the difficult waters of organisational change. I am very grateful to be included in the book. Alexander Richter, the publisher of the book, managed to assemble a very impressive group of academics and practioners to create a thorough, practical and inspirational guide for anyone interested in the future of work and organisations. Alex created a Twitter list of the authors, which also provides a great stream for inspiration and learning. I recently published a guest post called „A German perspective on successful social business stories“ on the Ripple Effect Group blog. Many know of examples of social business transformation in the Anglo-American hemisphere, but in the past few years some German companies have stepped into the limelight. In the post I present the stories of adidas Group, Robert Bosch GmbH and Continental and highlight some unique approaches these companies took that contributed much to their success and might in the end be rooted in certain German cultural norms and traits.